Slappey & Sadd, LLC is a personal injury law firm that successfully handles Bus Accident Injury Cases resulting in wrongful death or severe injuries that permanently impact the victim’s quality of life or long-term health. Slappey & Sadd, LLC is an experienced and highly qualified bus accident lawyers that can handle your accident and injury from the beginning all the way to trial, if necessary, in Atlanta or anywhere in Georgia. How Many Children Are Injured as a Result of School Bus Accidents Each Year? More than 23.5 million elementary and secondary school children ride school buses daily throughout the United States. Many of these school buses do not have restraint systems or seat belts. Over 12,000 of these children are injured each year in school bus accidents. Some of these injuries are catastrophic, and as many as 11 children a year die as a result of school bus accidents. Why Are There so Many Bus Accidents? Bus accidents and school bus accidents often result in serious injuries or death. Bus accidents can be caused by such contributing factors as driver negligence, dangerous roadways, weather conditions, defective products and improper maintenance, among others. Our bus accident attorneys at Slappy & Sadd will pursue every factor that may have contributed to severe injury or accidental death in your case. What Should I Do if I Am in a Bus Accident? If you have been injured as the result of a bus accident either as a passenger, pedestrian or driver, you may be able to file a claim against the bus company. If you were a passenger on a bus that was involved in an accident, the bus company, whether public or private, owes you a “duty of extraordinary care” associated with being a common carrier. This “duty of extraordinary care” is higher than the negligence duty owed by the bus company to drivers of other vehicles and pedestrians. The accident injury attorneys at Slappey & Sadd have the experience and qualifications to help determine whether that duty was met in your particular circumstances. 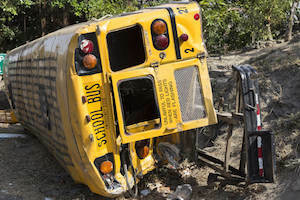 If you have been seriously injured or a loved one has died in an accident involving a bus or school bus, you need the advice of an experienced bus accident lawyer. Be aware that claims for damages against a public or governmental entity are complex and have strict time limitations. The laws are intricate and vary greatly depending on the circumstances surrounding the accident. Slappey & Sadd, LLC have represented those who have been seriously injured. Through experience and education, our firm’s attorneys are able to expertly evaluate medical injuries and pursue personal injury claims on behalf of the injured person and family. Slappey & Sadd, LLC provides sophisticated legal services for almost any type of injury, both emotional and physical as a result of bus accidents that cause severe injury or accidental death. If you or a loved one has suffered a traumatic injury as the result of another party’s negligence, we invite you to contact us at your convenience. There is no charge for initial consultations. Please call us at 404.255.6677 or toll free at 888.474.9616.